Asheville Outlets mall was the site and donated space, posters, flyers, programs, signage and other resources for our event (this was not included in the budget or hours spent on event estimate). Six local dealers rented display space in the mall for new models which were on display the week prior and week after the event. On event day, salespeople were in the Mall talking to people about the features and financing, owners were in the parking lot showing their cars and providing rides. We also rented space on event day to local photovolatic installers, green lawn care and equipment sponsors and clean vehicles coalition agency. Proceeds for the rental benefited the Blue Ridge EV Club (affiliated with the Electric Auto Association) and the Black Bear Solar Institute to further their EV education and advocacy efforts in the region. · On event day, Brightfield TS is donating Solar Driven® miles to offset all of the electricity delivered by the Asheville Outlets charging stations, so ride and drive on sunshine! · Register to win free prizes. Must be 18+ years old, one entry per person, register between 12 - 6 pm. Drawings on September 14 and winners will be contacted during the week. Winners must claim their prizes at the Asheville Outlets mall management office with 72 hours of notification. If the organizers are unable to reach the winner with the contact information provided on the entry, the prize will be deemed forfeited. Come out and see for yourself why Electric Vehicle sales have been skyrocketing. Just click on the "Register" button above to attend for free. 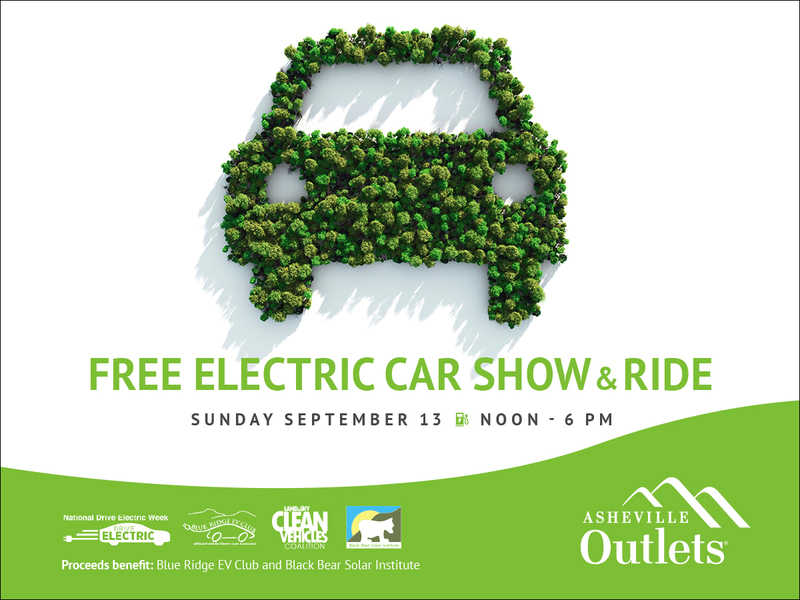 These events are organized by the Blue Ridge EV Club (https://www.facebook.com/groups/blueridgeevclub/), Asheville Outlets (http://www.shopashevilleoutlets.com) and Land Of Sky Clean Vehicles Coalition (www.cleanvehiclescoalition.org). Proceeds from rental displays by dealers and for-profit businesses benefit ongoing efforts of the non-profit organizations: Blue Ridge EV Club and Black Bear Solar Institute (http://www.blackbearsolarinstitute.org). There are currently 228 attendees registered. Registered attendees report 352,001 electric miles driven. Asheville Promo Video - September 13, 2015 - Be there!